We are a lean and agile print and web design firm located in St. Louis, Missouri. We specialize in creating high quality print designs and building original and user-friendly web sites. As experienced graphic designers, we know that a large budget is not a requirement for exceptional service and design excellence. It’s certainly not a requirement at TriFecta Creative. Our niche is creating high quality print and web materials for small business owners at an affordable price. We offer our clients a wide range of creative services including: brochures, business cards, logos & corporate identity, email marketing, print advertising, blogs, publications, trade show graphics, copy writing and much more. We don’t impose our ideas and personal taste onto our clients — our focus is on helping you develop your vision while analyzing your design requirements. With your vision as our guideline we create meaningful and engaging connections between your business and your target audience. 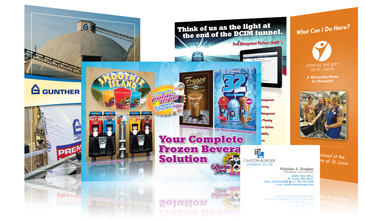 Our graphic design solutions (print & web) are unique – but functional – and will help you stand out from the crowd. We can help you solve complex client communication issues elegantly and intelligently across all media. Please feel free to complete our contact form to get started on your next project!